Types of Concrete Batching Plant: Know Before Concreting! Concrete is the most popular construction material. For the concrete to be durable and attain the desired strength the ingredients of concrete must be mixed in a definite proportion. Batching is the process in which the quantity or proportion of materials like cement, aggregates, water, etc. are measured based on either weight or volume to prepare the concrete mix. Concrete batching also helps in improving the workability of the concrete and helps in reducing the wastage of the materials such that one achieves all the desired properties of both fresh as well as hardened concrete. Concrete batching plant is a machine in which ingredients of concrete are mixed and blended homogeneously to obtain concrete of desired strength and quality. Here we have given information on types of concrete batching plants, which a site engineer must know. Also Read: Why Batching of Concrete is Important? Concrete batching plants can achieve proper and accurate batching of concrete. Concrete batching plants measure the quantity of cement, sand, coarse aggregate, water, admixtures, etc. for a required concrete mix design. Batching of concrete can be done by either weigh batching or volume batching. Weigh batching is done based on weight of the ingredients, while volume batching is done based on the volume of the ingredients. Concrete batching plants can be divided as transit mix plant and central mix plant depending upon the mixers. Transit mix plant/ dry concrete batching plant uses manual or digital scales to weigh the aggregates and cement. The water is also weighed or volumetrically measured separately. After weighing, the ingredients are then poured in a transit mixer, which is transported to the site. All the materials are mixed during transportation to the construction site. Water is either added on site or during transportation depending upon location of plant and site. Central mix plant/wet concrete batching plant weighs all the required ingredients including water. The ingredients are mixed in a mixer located at a central location in the plant. After the mixing process, the concrete is poured in to agitator truck, which transports it to the site. It should be kept in mind that the truck must be moving so that the solidification of concrete does not occurs. 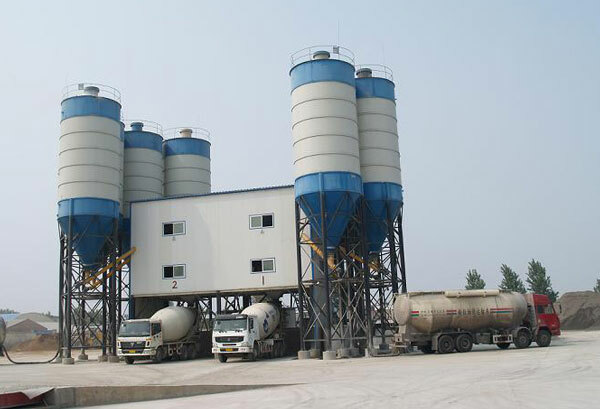 Concrete batching plant can be classified as stationary concrete batching plant and mobile concrete batching plant, based on the location of the plant. Stationary concrete batching plant as the name indicates are stationary and are located at certain distance from the construction site. The concrete is batched and transported using a truck to the construction site or on site. Stationary concrete batching plants are easy to install. They are large in size as compared to mobile concrete batching plant. They have higher efficiency and produce good quality concrete. Care should be taken that the truck reaches the site at the desired time. Otherwise, solidification of concrete will start and hence inferior concrete will be delivered. They have wider range of capacity of batching as compared to mobile concrete batching plants. Stationary concrete batching plants are generally used for commercial projects having large duration and large demand of concrete. Sometimes the stationary concrete batching plant is located at such a distance that the cost of transportation of the concrete increases and hence leads to high cost of construction. In such cases, mobile concrete batching plant are more popular. They are compact batching plants, which has material storage, weighing, mixing, and discharging units. It has flexible movement and hence can be transported to the construction site. Thus, batching of concrete is carried out on-site. After setting up the plant, the contractor can adjust the concrete production according to the requirement of the job. After the construction is over the batching plant is transported to another site for further use. By using the mobile concrete batching plants, the delay in transportation of truck can be avoided, unlike in case of stationary plants. However, this type of concrete batching plants are said to have less efficiency and capacity then stationary plants. Batching of concrete is an important aspect of concrete construction. If the ingredients are not properly weighed, then the concrete will not achieve the desired strength and hence the overall durability of the structure decreases. 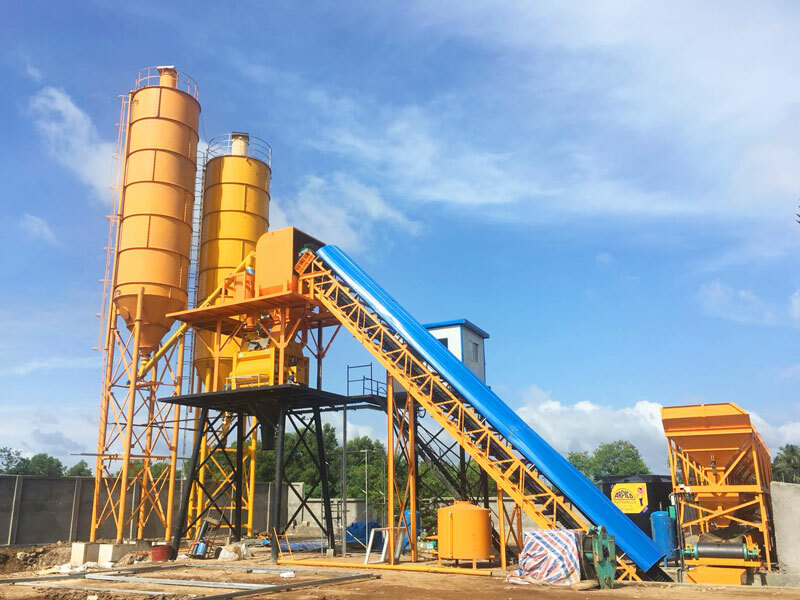 For small-scale projects, manual batching can be done, but for large and important projects, it is better to have a concrete batching plant for high efficiency, high speed, and accuracy and quality concrete. Previous PostPrevious How to Prevent Bittiness Paint Defect?